I’ll be teaching yoga again at the beautiful studio in the Julia Morgan designed Hearst Gym this semester. If you are UC Berkeley staff, click the links to register: 2/15, 3/8, 4/12, 5/3. Practicing yoga can release tension in your joints, give you greater range of motion, and offer increased comfort in all aspects of your life. Learn basic yoga poses and breathing techniques to transform your practice into a moving meditation. Optional: Join the Yoga Passport Challenge and get a different stamp for each class to be entered into a drawing for a yoga prize! Yoga Passports will be available at the first class. Bring your passport to each session you attend and have a square stamped for each date. Attend more classes for more chances to win! Please bring your own yoga mat as our supplies are limited. Come early and be ready to start promptly at 12:10. Instructor: Laurie Ferris Laurie’s Bio. Sound Healing is the practice of listening to soothing sounds to reach profound states of clarity and relaxation. It opens up deep meditative states that are usually unreachable without considerable effort. During the event, participants are bathed head to toe in sound— it’s a very hypnotic, ethereal experience. You will come away with a clear mind, and a deeper appreciation for the wonder of sound. Grace Cathedral looks absolutely spectacular right now. They are featuring an art exhibit, “Les Colombes: The Doves” by Michael Pendry up— it’s two thousand paper doves, symbols of spirit and peace, will soar in a 45-foot long aerial sculpture. You can learn more about the sculpture on Grace‘s site. Guests are asked to arrive by 7:30pm. Doors close promptly at 8pm. Yoga Nidra, or “Yogic Sleep”, is a state between sleeping and waking. You will be guided on a systematic journey to the deep, quiet layers of the self. Practitioners can experience a deep state of relaxation while maintaining “a trace of awareness”. Yoga Nidra calms the mind, restores the nervous system, and increases resilience. This class will begin with gentle yoga postures to help you transition from the external world toward the more inner landscape. The second half of the class is a guided relaxation/ meditation done lying down in a comfortable reclining position. Take a day to yourself to help you get back on track and away from everyday stress. In our busy world we are faced with obstacles that can obscure what our true purpose is and why we are here; often leaving us feeling depleted and isolated. This mini get-away is designed for you to get re-calibrated and feeling all vibrant and new with the ultimate self-care; get clearer about what matters to you and how to move forward. You will be in conscious community and meet others who are passionate about wellness and vibrant living. 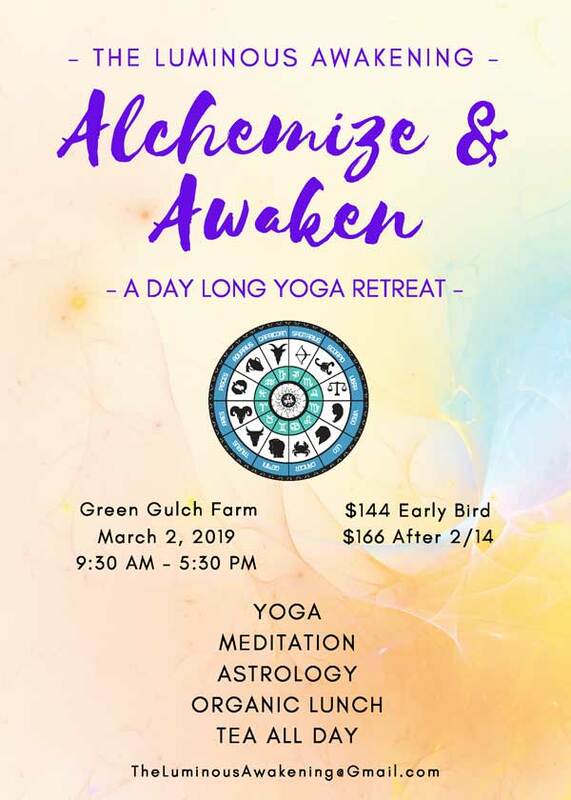 Join Anne and Nicolette for a dynamic day at Green Gulch Farm, a truly a magical place that inspires harmony with nature. Experience a medicinal medley of offerings infused with astrological insight; alchemized yoga asana, meditation, purposeful pranayama, self myo-fascial release utilizing Yoga Tune Up® Therapy Balls, dharma talks on how to walk away using the power of astrology and Yoga Nidra inspired guided meditation to bliss you out and re-awaken your innate truth and knowing. The retreat starts at 9:30am and ends at 5:30pm. This challenge is free to sign up and participate. Practice yoga every day, interact with your fellow challenge participants, and you could even win one of their daily prizes! Let these science-backed tips and tools be your guide this month. You’ll want to bookmark this calendar and refer to it often because there are links to articles and resources embedded in the PDF. Download happiness calendar for February. ATTENTION: UC Berkeley Staff – Save WorkFit! We have heard that the funding for the much beloved WorkFit program has been cut. Many of us who participate in WorkFit have come together to create the WorkFit Advocacy Group (WAG) in order to encourage the administration to secure a new funding stream to maintain this valuable program. Please fill out the a WorkFit Google Poll so we can share specific information with the administration about the value of this program. If you are interested in participating in the advocacy group, please email Deb Danziger at ddanziger@berkeley.edu. She can share instructions for future actions. That’s a wrap for February! Please let me know if you have events to consider for future newsletters.